Jacob van Ruisdael elevated landscape painting to the level of high art. Recording the familiar wooded hills, flat farmlands, and coastal dunes of the Netherlands, his work went beyond the topographic accuracy of earlier generations to achieve a sense of the monumental grandeur of nature. His extraordinary powers of observation were wedded to a Baroque inventiveness that endowed his works with an unparalleled dramatic force. Among his most highly valued works, Ruisdael’s rare marine paintings reveal the scope of his genius, as they convey the transitory and changeable face of nature. Rough Sea at a Jetty represents the approach of a violent storm. The scene is taken from a jetty that extends a considerable distance into the sea. At the end is a rustic beacon to guide distressed ships into harbor. 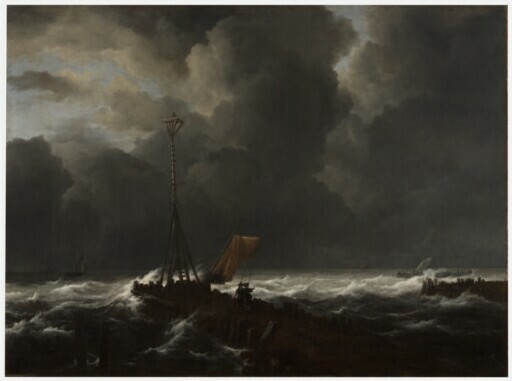 Two men with long poles stand, ready to come to the aid of a vessel striving to make port through the tempestuous winds and waves that threaten its approach. The beacon appears in Dutch emblem books as a symbol of salvation in time of peril. purchased by (Pierre Fouquet) for 264 Dutch florins. sold to (or bought in by) Louis-François-Jacques Boileau for 1460 francs. purchased for 1601 francs by Sigismund Ehrenreich, Graf von Redern [1761-1841]. by descent to his son, Charles Hope Petty-FitzMaurice, 7th marquess of Lansdowne, 11th lord Nairne [1917-1944], Bowood House, Calne, Wiltshire. Probably his sister, Katherine Evelyn Constance Petty-FitzMaurice Bigham, Lady Nairne [1912-1995], Bignor Park, Pulborough, Sussex. (Possibly Thomas Agnew and Sons, London, c. 1950-55). purchased by Kimbell Art Museum, Fort Worth, 1989.